Warm and cozy greetings dear friends! It looks like an arctic blast is headed this way by the weekend…brrr! We have had so many days of gloomy skies and rain, I have lost count. I sure will be glad to see the sun and blue skies! Since my home was decorated for Christmas most of November and December, I am really keeping it simple during January! 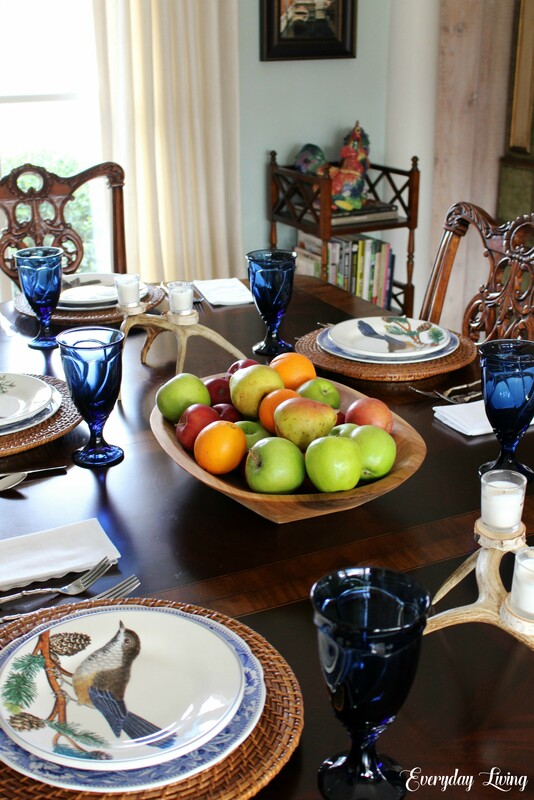 This weeks tablescape is brought to you by a Bowl of Fruit…come inside where it is warm and join me! There is something I like about seeing the bare wood of my table…it gives a warm ambiance to the space. For a quick and simple centerpiece, I raided my fruit bin in the refrigerator! I grabbed the dough bowl and filled it with red delicious apples, Granny Smith’s, sweet pears, and Cara Cara oranges. A simple fruit centerpiece looks amazing and smells wonderful! 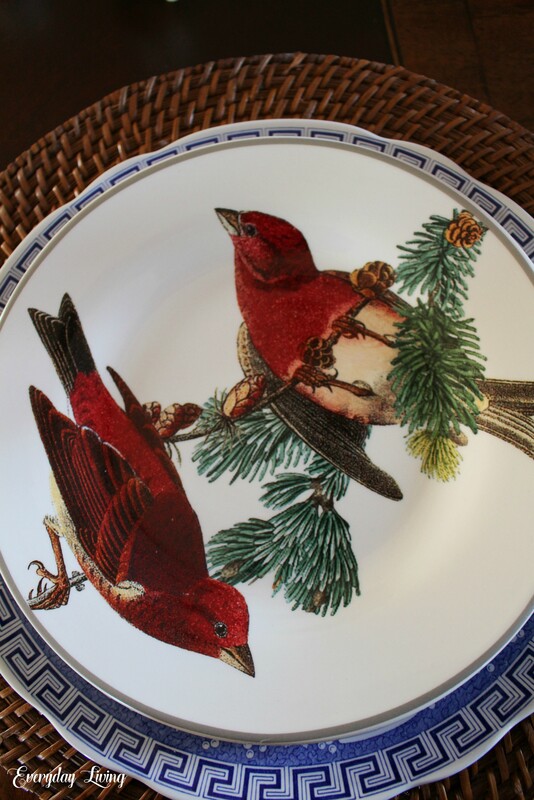 …and color was added from the Winter Fauna salad plates that depict birds like the brilliant male cardinal! 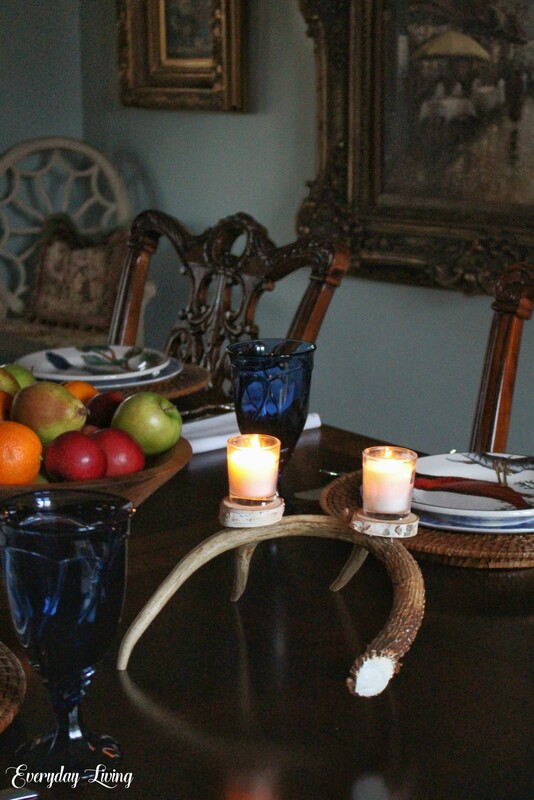 Flanking the bowl of fruit are a pair of hand-made antler candle stands that were made by my son several years ago. I love their simplicity! The plates were from Pottery Barn several years ago and are no longer available. Twig flatware from Pier 1 seemed most appropriate for this table. I used my Spode Blue Italian dinner plates. Wishing you all a joy-filled day! Thank you so much Anita. Enjoy your day! Well I think that looks very nice. I had to laugh about the post being brought to us by a bowl of fruit! Thank you Cath. I hope you are doing well! A most beautiful tablescape! 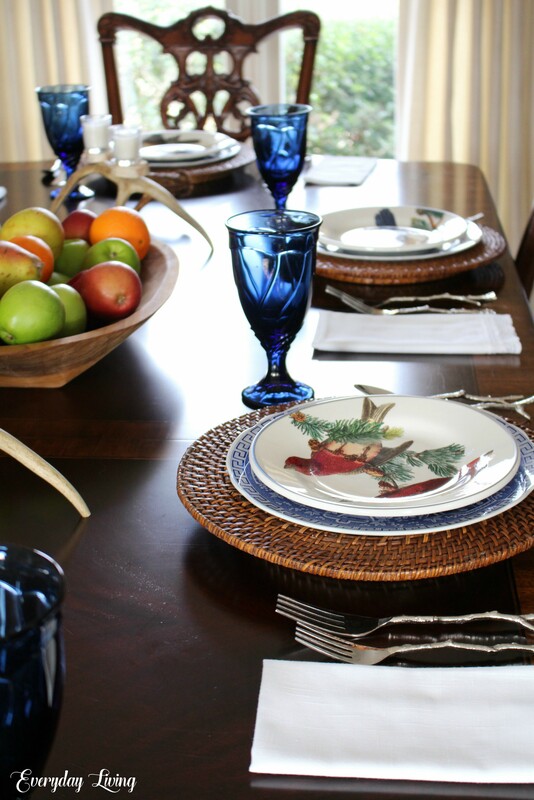 The bird plates from Pottery Barn are perfectly paired with the blue and white plates and wicker placemats. I agree that simplicity during January is refreshing. The Pottery Barn plates are perfect for this time of year. Blessings Pam. Hope you are feeling better. Thank you Dianne. I am feeling much better thanks to rest. Have a wonderful Tuesday! I love the simplicity of this table! Being backyard bird watchers, I love your beautiful bird plates. Your antler candle sticks are perfect, beautiful and a treasured gift. Thank you for sharing your beautiful table with us! Linda, I love watching the birds during winter, especially the cardinals and blue jays. Their color is so dominant on the gray landscape. Thank you and Happy Tuesday! Fruit is one of my go-to table centerpieces. I almost always have some in the house and if I don’t, it’s quick, easy and inexpensive to find and you can eat it! Your table is especially lovely and I really do love those dishes. Those birds make me very happy! Thank you Jeanie. Cardinals and blue jays are scurrying all over this morning! Happy Tuesday! Thank you Mary, stay warm! A beautiful tablescape, Pam. The wood in your table is gorgeous and I love to see it. 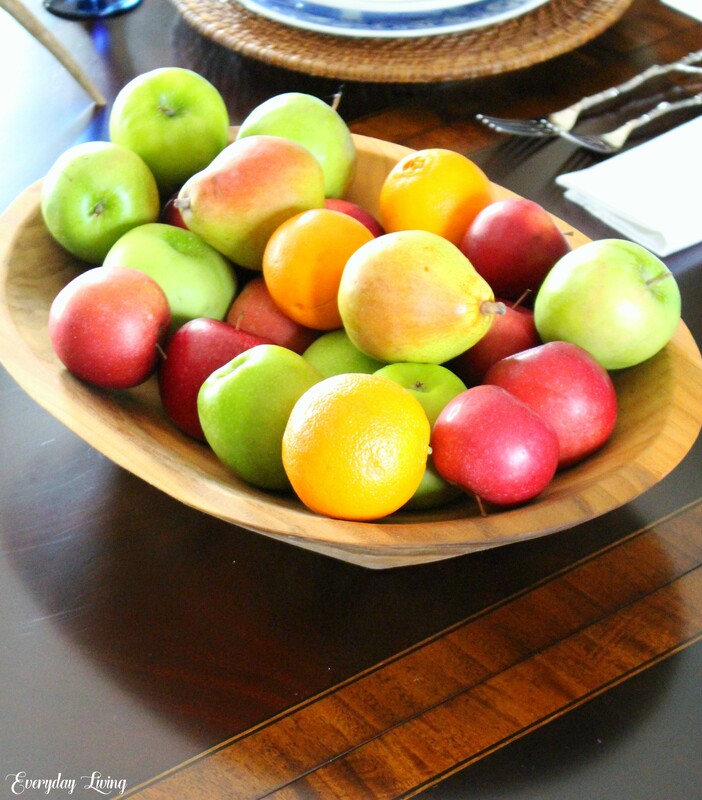 There is nothing prettier than a lovely bowl of fruit and in your wooden bowl, it is perfect. 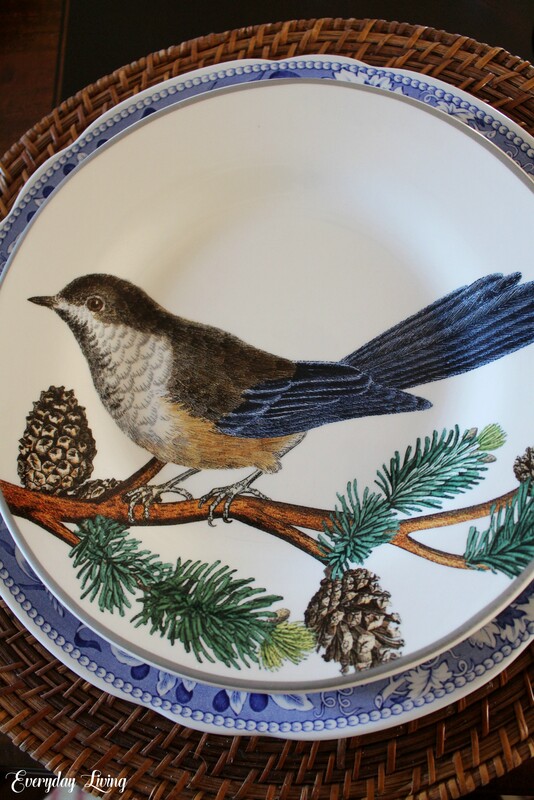 Your bird plates add color and cheer for a winter day. Dreary days are normal for WV in the winter, however, it seems as though we have had an abundance of them this winter. I don’t remember when we had a blue sky. Stay warm and have a wonderful week, dear friend! Thanks so much Sandra. Wishing you wonderful week! Ooh I do love the winter fauna plates and the fruit bowl. I’ve been dreaming of painting my kitchen and dining area. 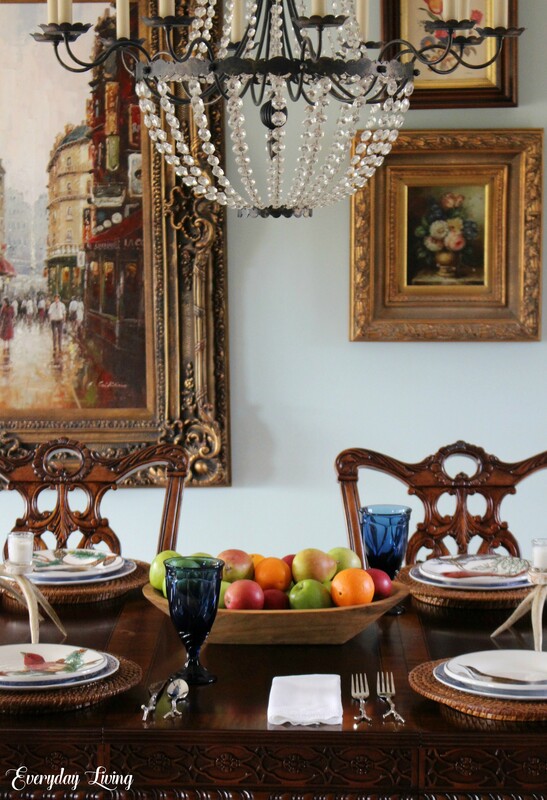 I hadn’t thought of blue but each time I see your dining area I love how fresh it looks. We’ve had way too many gray days too but I guess it’s just part of the deal with winter. When the sun shines it sure feels glorious! I agree with the others- I enjoy seeing the beautiful details of your gorgeous dining table. Thanks so much Liz. I am enjoying my blue walls! 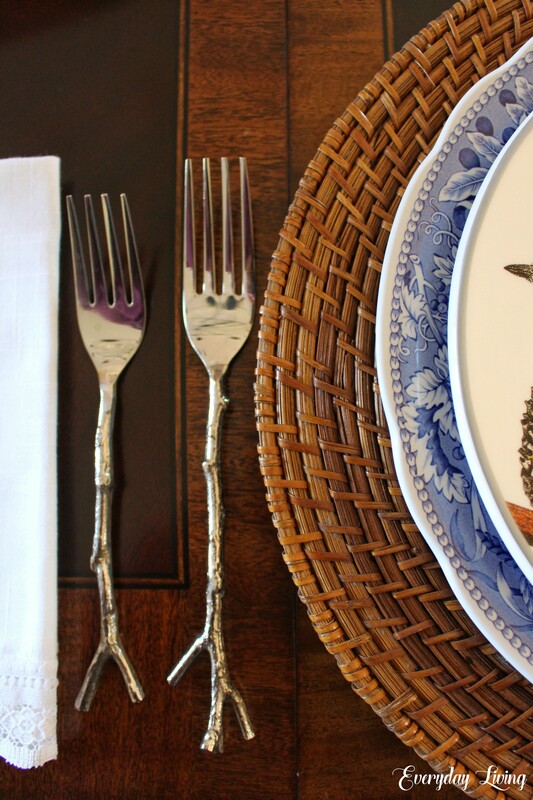 Love those bird plates and twig silverware! Your table looks perfect for January. 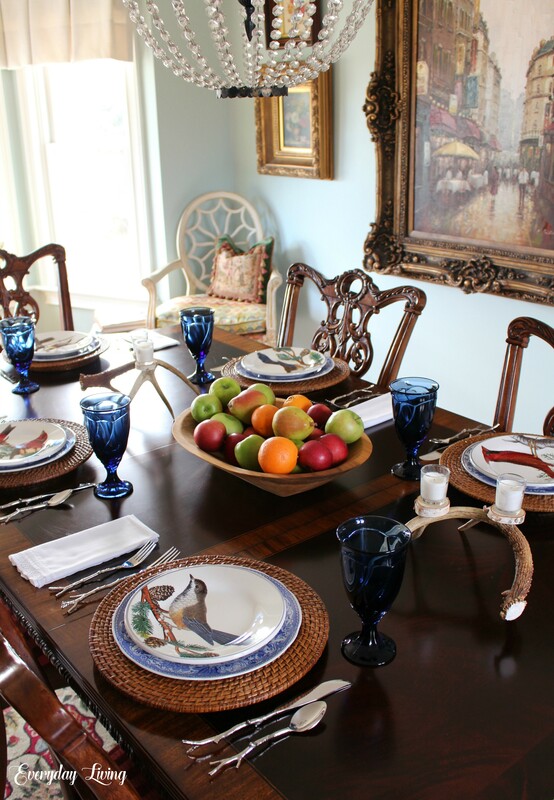 So beautiful Pam, I love the way the blue stemware really shines and creates a winter vibe with the fruit bowl and the gorgeous bird plates, such a pretty and perfect setting for dreary January days! Thank you Jenna! The dreary days continue, maybe sunshine tomorrow. Your words to Mother Nature’s ears I hope! Thanks so much sweet friend! Blessings always! Pam your table looks lovely with the brown of the table not covered. Thank you Marilyn! Enjoy your week. Love those bird plates. They are very special. The fruit looks so inviting. Thank you Marion. I hope you are having a good week! I’m new to your blog and loving it! Wish the bird plates were still available. A friend from Western New York. Welcome Janet, it is so good to have you here! I wish they were still available, also. It is all so beautiful Pam! 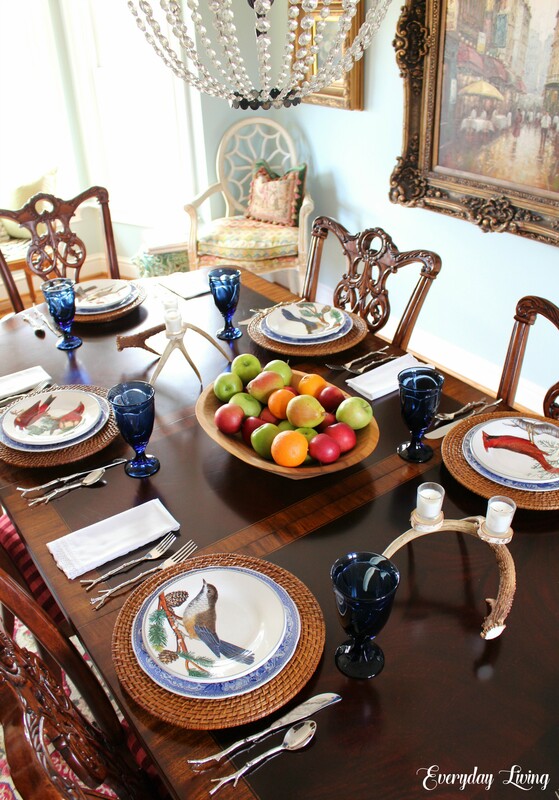 Love the bird plates and especially the Chickadees…my fav!…and you are right..nothing like seeing the beauty of the wood of the table! Such a lovely and colorful table in these days of dreary weather! This gorgeous tablescape is one of my favorites…Simple and elegant!The dishes are wonderful!! !Blessings,dear Pam! Who wouldn’t love a bowl of colorful fruit, and I love your bird plates! Thanks so much. I tried to find your blog, and maybe just me, but I couldn’t. Please send me a link. This is quite beautiful! I know what you mean about the bareness of January. There is something welcoming about it after the extravagance of the holidays. Yes, Kristina and thanks so much for your visit! Beautiful table, Pam! I love watching birds too and your plates are lovely. I’m enjoying my bare wood dining table also. I also love that pretty piece of furniture with books that I spied in the corner of your room. Stay warm!! Thank you Roxanne. Yes you spied books, they are everywhere! Sorry, I am so late commenting. Yesterday was hectic. Your table is just beautiful, Pam! A pretty bowl of fruit makes such a pretty and welcoming statement. 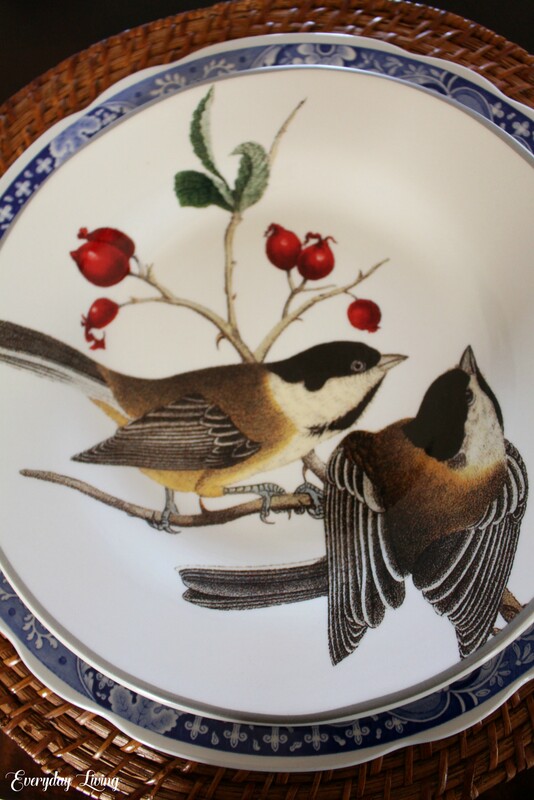 I love birds so I adore those lovely plates! It has been very gloomy and cold here, too. We are expecting single digits and a winter storm this weekend. I’m so ready for spring. Enjoy your day, sweet friend!!! Thank you sweet Shannon. We are expecting our coldest temps of winter this weekend. Stay warm sweet friend! Wonderful Table! Love how the colors God gave us in nature go sooo well together. Brown, Blue, each piece of fruit. Thank You! And being a bird lover, each and every bird! Thank you so much Barb, I also love birds! Your lovely tables always brighten my day – love the birds! Sometimes the simplest of things are much welcomed. 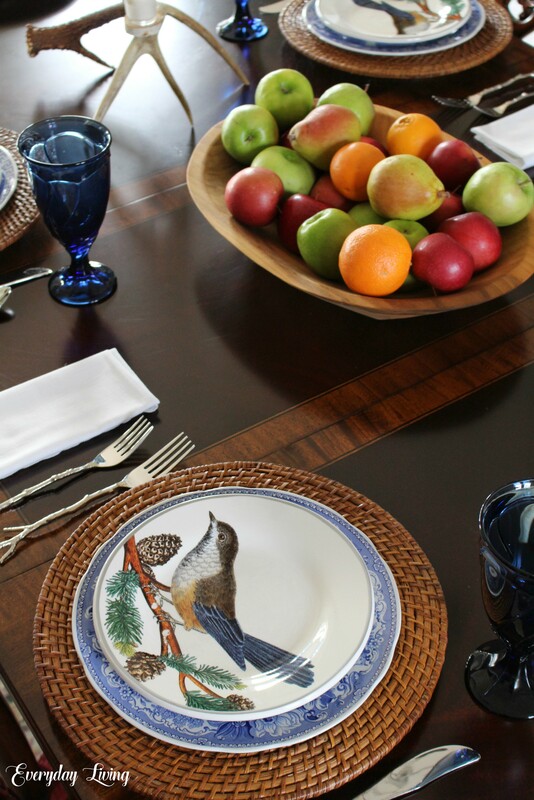 The bowl of fruit, the bird plates and twig place settings are a nice combination. Love those plates, and the flatware is the perfect complement! I am sharing this in my tablescape Facebook page!! Thanks for the share, Chloe!